Open primaries has become a hot issue in Florida as people have been showing up by the dozen at hearings across the state to testify before the state’s Constitution Revision Commission. Open Primaries Education Fund recently collaborated with Spectrum News to host a live television town hall in Orlando to discuss the pros and cons of open primaries. The panel of experts included: Steve Hough (President of Florida Fair and Open Primaries), Professor Charles H. Rose (Stetson University College of Law), Glenn Burhans Jr. (Attorney and Florida election law expert) and Supervisors of Elections from Polk and Seminole Counties. 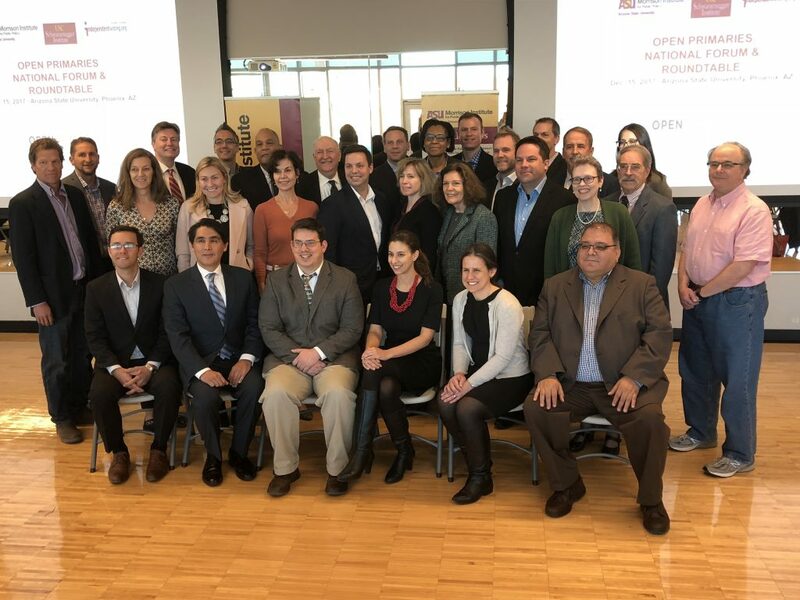 In December 2017, a consortium of ASU Morrison Institute for Public Policy, the USC Schwarzenegger Institute for State and Global Policy and Independent Voting, a national organizing center, hosted a daylong national forum and roundtable on the topic of open primaries. The event was convened at the downtown Phoenix campus at Arizona State University via sponsorship by the Open Primaries Education Fund to review current research, scholarship and on-the-ground experience with open primaries and their impact on voters and governance. The roundtable brought together leading researchers, frontline thought leaders and activists, creating a dynamic opportunity for academic researchers and political front liners to explore each other’s work and perspectives.